Dubai: An Indian expat in the UAE has warned residents and tourists about the dangers of travelling without health insurance as his family is paying a heavy price for not taking the same seriously. Speaking to Gulf News, Anubhav Khanna, a digital marketing executive who came to Dubai 11 months ago, said his father, Surendra Nath Khanna, was visiting him in Dubai, when he took ill and was admitted to the NMC Royal Hospital at Dubai Investment Park on March 15. Ever since, it has been one harrowing day after another, as the family has been hard-pressed to foot the high cost of the 67-year-old's treatment. The doctors told us they could either save his limb or his life. He said his father’s condition was critical, but with prompt treatment, he began to make progress. However, he developed gangrene in his left arm over the weekend, leaving the doctors with no choice but to amputate the arm, elbow-down. “The doctors told us they could either save his limb or his life. The decision was obvious,” said Anubhav, adding that the gangrene had also spread to part of a lower limb, but was controlled. Adding to the trauma was the fact that the hospital bill kept mounting. Anubhav said he and his brother, Vibhav, had drawn on all their life savings and borrowed money from friends and family to pay Dh80,000 to the hospital. This was in addition to a sum of Dh42,000 they had to pay an Indian air ambulance operator to transport their father to a Delhi hospital. 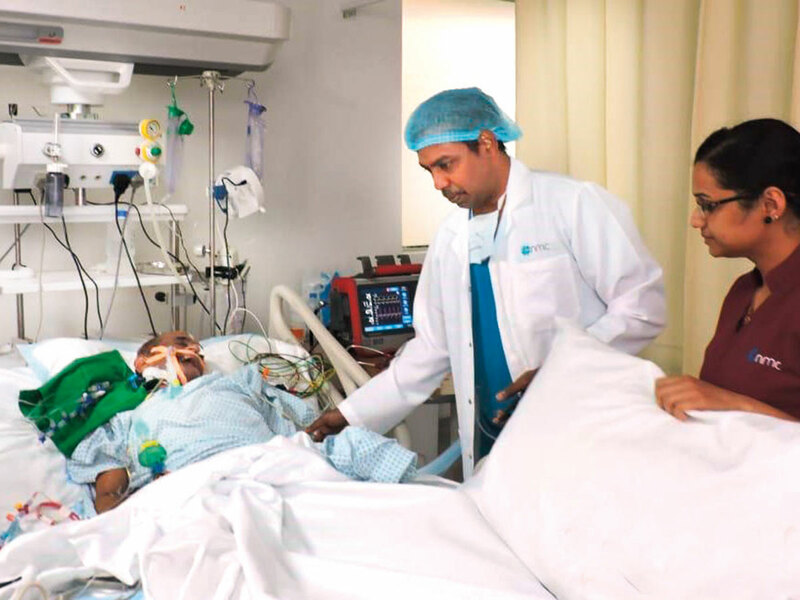 Anubhav said they had to subsequently change the operator against a payment of Dh120,000 as the oxygen requirements were high, even as a large part of the money they had spent on the first operator remained yet to be recovered. But thankfully, NMC hospital yesterday waived off the remaining chunk of the uninsured patient’s hospital bill and discharged him so that his family could transfer him to a hospital in India. Hours before flying out, Anubhav said his father, who is on the ventilator, is not out of the woods yet. “It has been a huge lesson for me. I never thought of taking a travel insurance for my dad. Neither did he,” he said, pointing to how financial constraints can compound a medical crisis. But he was very thankful that the hospital had waived off what remained of his father’s bill. “I do not know how much more we owed them, but it would be a sizeable amount. We are very grateful for the support they have extended to us,” he added. He said besides the importance of getting a travel insurance during visits, people should make it a point to get regular health checks, whether there is a complaint or not. “It’s better to be safe than sorry,” he said. Whose responsibility is it to get a travel insurance? According to Samuel E. Thakker, managing director, Earnest Insurance, visitors to the UAE may have obtained a visa upon landing, from a travel agency, or from relatives and companies sponsoring them for a visit. He said Ministerial Decision No. 322/ 2008 makes visitor health insurance mandatory. However, the current practice does not require the party sponsoring the visitor to take out insurance, or to bear the costs. He said these policies only cover immediate life threatening emergencies. “It must be sudden or accidental (as opposed to gradual). Thus, pre-existing and chronic conditions are not the intention and as such they are generally excluded. Coverage is in respect of medical, pharmaceutical and hospital expenses incurred on medical prescription, in urgent cases and arising out of medical conditions which have occurred during the trip. It includes ambulance transfer to the nearest medical centre, covers accidental death and repatriation. Cover is up to specific limits,” he said. Offered up to 80 years age by some providers, premiums are nominal, non- refundable and non-transferable, and on single trip, or multi-trip six-month period, he said. A one-month travel insurance can cost Dh40-Dh240, depending on plan and policy provider. It can provide cover for up to Dh150,000.